Stuff turkey just before roasting, not ahead of time. Fill wishbone area lightly with stuffing. Fasten neck skin to back with skewer. Fold wings across back with tips touching. Fill body cavity lightly. (Do not pack--stuffing will expand while cooking.) Tuck drumsticks under band of skin at tail, or tie together with heavy string, then tie to tail. 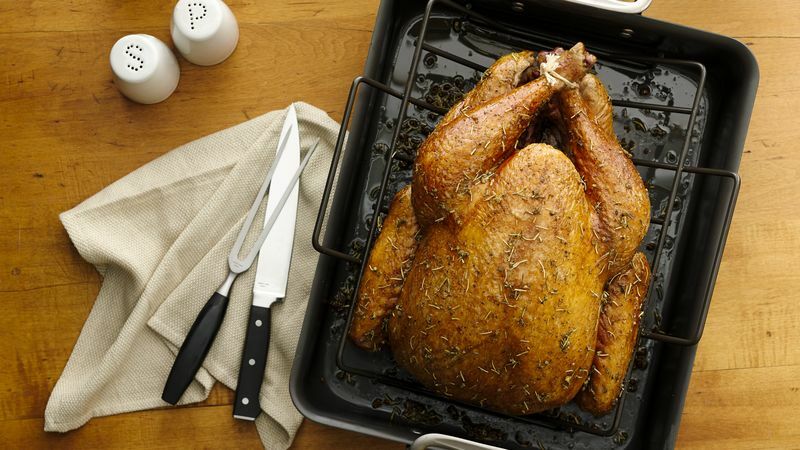 You'll have the perfect turkey for 12 people--with leftovers for tomorrow's sandwiches! Baking stuffing in a casserole makes preparing the turkey easier on the cook. Just grease a 2 1/2-quart casserole and spoon in the stuffing. Cover and refrigerate until about 45 minutes before turkey is done. Bake covered in same oven with turkey 30 to 45 minutes or until hot. Be sure to let the turkey stand for about 20 minutes before carving. You'll be rewarded with evenly cooked, moist and juicy turkey meat.